Theatre marquees brace for impact this weekend from six new releases, all jockeying for mind space. Some of them are going to get it, and some are going to fail miserably. 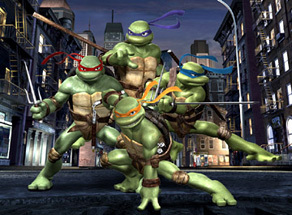 A good favorite to lead this new crop is TMNT, a 14-years-later sequel to the Teenage Mutant Ninja Turtles franchise. With the revival of a lot of comic franchises on film lately, and the success of some pretty marginal adaptations (Ghost Rider anyone?) it's not surprising that studios might start to revisit some of the moldier projects out there. What's unique about this one is that while the original movies were live action, TMNT has gone the CGI route, animating the whole deal. It's a slick enough looking production, and the animation has let them bring in some pretty big names for the voices, including Patrick Stewart, Laurence Fishburne, Sarah Michelle Gellar and Zhang Ziyi (who I don't really think of as a voice actor, but it's their dime). While the comic was slyly subversive originally, as it morphed into a toy machine, it became a bit of a joke, and by the time the second movie came out – well, the less said the better. It remains to be seen how well this next generation of kids will pick up on the turtles (with a PG rating, it's clearly aiming at kids), and just how much nostalgia there is out there amongst Gen Xers. I think they should be able to grab a pretty good cross section of these folks, although it doesn't look like they've done nearly as good a job as they could have and it lacks that "wow" factor that an animated version really could have had. Still, there's enough value here that on over 3,100 screens, we should see a weekend number of $23 million. The action offering for the weekend is Shooter, starring Mark Wahlberg. He plays a former army sniper who is recruited to provide security for the President when an assassination attempt is discovered. However, it turns out he's being setup to be the patsy, and must prove his innocence and get back at those who framed him, while being pursued in a national manhunt. It's almost as if someone decided to make a movie from Lee Harvey Oswald's point of view. Wahlberg is riding high after an Oscar nomination for The Departed, and has built up a pretty good CV of box office performances, including Four Brothers and Invincible, which opened to $21 and $17 million respectively. A conspiracy-minded thriller might be the thing to push him into the top realm of action stars. That is, if the film is any good. Directed by Antoine Fuqua, who gave us Training Day (that's good), King Arthur (that's bad) and Tears of the Sun (can I go now? ), it's a bit of a crapshoot, and reviews are not kind to this point. That's not to say that they've ever been kind to Wahlberg or Fuqua, and their histories should lead to a mild hit. Give it about $20 million for the weekend. Competing with TMNT for the family dollar this weekend is The Last Mimzy, which makes it to theatres after two weekend of sneaks trying to drum up business. Based on the children's short story Mimsy Were the Borogroves, it's that rare breed - the sci-fi family film. Two young children seem to be developing mysterious powers and abilities, which they attribute to a friend they call Mimzy, who seems to be a stuffed animal. When these abilities continue to manifest themselves, it becomes a question of whether these powers are good or evil. The tone of the film seems to evoke Spielbergian family films of the mid 1980s, especially E.T. and Joe Dante's Explorers. It comes by some of that feel honestly, sharing a producer with Close Encounters of the Third Kind, and its director is Bob Shaye, who was a producer on the Lord of the Rings films (and founded New Line films). It's backed with an eerie and crackerjack trailer, and I suspect this is the kind of film that's going to have a ton of passionate defenders, but it's not the kind of flashy movie that catches on immediately. Still, I see a decent weekend total of about $11 million here.